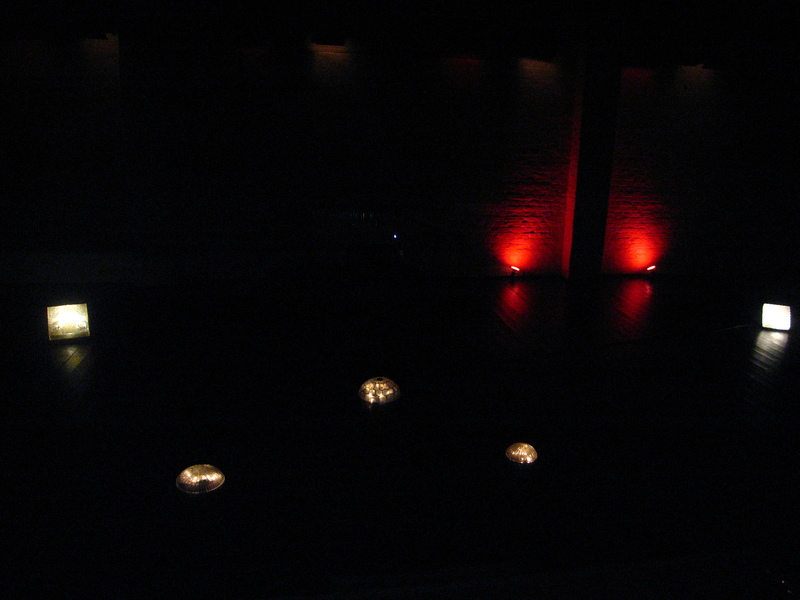 Wednesday, with South Berlin-North Berlin, I was part of a festival organised by the English Theatre Berlin, speaking singing switching on switching off my lights on a wide black wooden floor, in front of a scattered audience. Thursday, I took advantage of my artist pass and attended a long evening of performances. At the break, tight and stiff in the middle of the others, I recognise seated in front of me one of the official photographers of the theatre, that was there the day before for my reading. I look at him, his eyes turn towards my face, go through, unwaveringly empty, as far as I am concerned. I turn over, accepting my incognito solitary writer destiny. The slender silhouette of a young woman with long brown hair appears in the right shot. and to continue to speak from the darkness. Mercredi, avec South Berlin-North Berlin, je participais à un festival organisé par The English Theatre Berlin, parlant chantant allumant éteignant mes lumières sur un grand plancher noir, devant un public clairsemé. Jeudi je profitais de mon pass d’artiste et me rendais à une longue soirée de performances. A la pause, serrée, un peu raide au milieu des autres, je reconnais assis devant moi le photographe officiel du théâtre, présent la veille lors de ma lecture. Je le regarde, ses yeux se déplacent sur mon visage, le traversent, résolument vides, en ce qui me concerne. et continuer à parler depuis l’obscurité. Why the hell were we going to Brétigny ? Doubt was sneaking in on the R.E.R. platform as a thirty minute trip from Châtelet was about to start. Exotic from the boarding onwards, the journey opened by discussing with a white-collar worker, familiar with the complexity of public transport, who tried to convince us of the advantages of fresh-air-suburban-life. In Brétigny-Gare, a cheerful communication with local shopkeepers showed us the way to the contemporary art centre where a presentation of performances was waiting for us within the context of a “Noise & Capitalism” event. By coincidence, an acquaintance from Berlin had been invited to perform. Despite his very doubtful air on what could this story of Noise & Capitalism be all about, I had decided not to miss this, and to take Constance with me, delighted to “travel at last out of Paris”, had she said with a childlike look while staring at the flashing-by trees through the train dirty window. The C.A.C (contemporary art centre) was standing in the middle of anonymity. We could have been anywhere in France (but certainly in France), in front of the cemented high school, by the gymnasium, opposite the parking lot. Strangely new, well laid out, well equipped, it was impatiently waiting for us, if we were to believe the intrigued and happy eyes of the group of male adults, trendy clothes and hairdos, in front of the glass doors. A smaller group of Emokids was facing them. We were clearly in presence of the artistic professional team on one side, on the other of its only audience, freshly coming out of the aforementioned school. Our arrival was undoubtedly bringing a touch of enthusiasm to the thirty-year-olds smoking in front of the small poster, that was attempting to entice the teenagers with a “Tonight noise concert”. 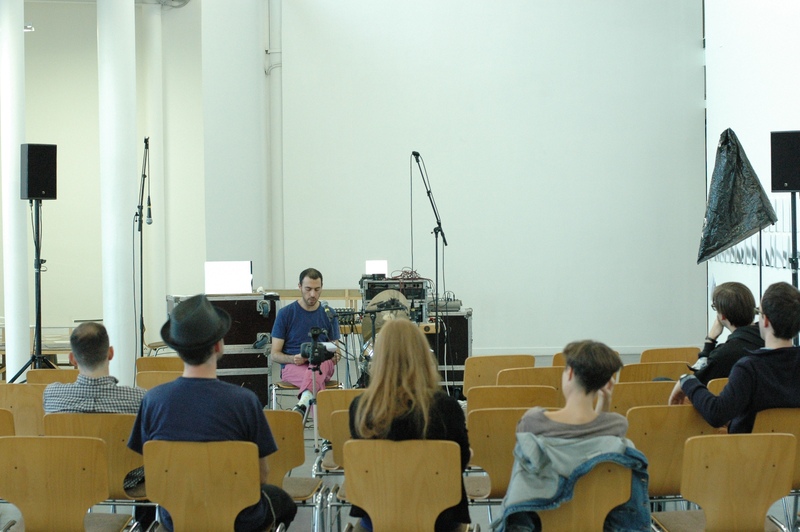 The first performance, from the Berliner acquaintance, was presenting to the nearly empty room the doubts of its performer concerning the validity itself of his presence amongst us. Seated, crossed legs, in an international English mixed with a strong Argentinian accent he was slowly listing Wikipedia extracts and series of questions on the whys and wherefores of noise, every now and then interrupting the reading of his paper to glance at the room with dark, inquiring or intense eyes, it was hard to say. To take his revenge for his perplexity maybe, or for lack of a better idea, he then had undertaken to invite the festival curator to comment a selection of quotations that, he was to reveal only at the end, came from the next performer on the list. The curator-artist started thus to publicly denigrate one of his guests. I turned around, fingers stuck in my ears, while the Berliner with the Argentinian accent, now standing up, was hitting a small metallic object with a stick, to prove to us he could be very noisy too, if he wanted: the room had entirely emptied from its audience, apart from us and the professional team, the Emokids having strangely disappeared without us noticing. The next on the list, the noise Polish musician, and a loyal stooge already fairly soaked, got down to work. Very ill-prepared for the event, we had to make a swift move and evacuate the room. I was soon sneaking in again, two pellets of kleenex firmly stuck into my ears. The sensation must had been the same immersed in a 747 jet engine. The experience was not totally uninteresting: I was seeing more clearly the link with capitalism. I had spent several years of salary work in school dining halls, and always well believed the studies comparing the sonic level there to precisely the one of a landing runway. After a short break, we prepared ourselves to brave the third performance. A bowler-hatted young man, swirling between the speakers, was hurling as much noise as he could, helped by various accessories, mimicking rock stars’ grin, spiting into the air, falling on his knees… I confess, I was experiencing focusing difficulties: on the glass doors’ side widely opened onto the granite-like pavement, some minor events were occurring. A group of joggers in full fluorescent gears, the five faces turned by the surprise towards the sonic epicentre, crossed the space in slow motion. A lady walking her yorkshire was starting a conversation with the Polish bruitiste. She was visibly exhorting her dog to listen to the performance. The latter, however, gave up. But a few minutes later, in the distance, a mob of women over sixty was approaching, their yorkshires anticipating them from their leashes’ end (I insist, these were yorkshires only, even from this distance I was well aware of it). Alas, just like with the Emokids, the next peek revealed a scene entirely emptied from its actors. In my back, the Polish’s loyal companion had dozed off in a large white pouf, a sherry bottle by his side, a put up rolled cigarette between his fingers. Adopted by the professional team, the evening went on for us in the Asian restaurant of Brétigny. We were clearly for the owner an unexpected windfall, she got the tables moved. All this had an air of costume drama, the inevitable scene when they enter the inn. Jugs were ordered ; she was trying, order book in one hand, to convince us to take the all you can eat menu. The two noisy musicians, completely drunk for the loyal stooge, harder to say for the noise master, were insulting the staff behind their back, sending back the rosé jugs to ask for red, the sherry dregs stashed at their feet under the table. The more conceptual artists were worried about their vegetarian diet: should they take sticky rice ? The French menu was confusing… I had to choose for some, others produced a “vegetarian passport”. The latter was presenting with simple drawings the authorized ingredients. The owner burst into uncontrollable laughter, and ignoring the aggressive muttering in alcoholic Polenglish at the end of the table, came back asking with a radiant look on her face: “Who wants more beer ?”. I was keeping an eye open on the vegetarian menus, but probably lacked vigilance concerning the non-alcoholic drinks. An exuberant diabolo menthe1 substituted thus for the original order – a plain lemonade. The Scotsman’s expression, discovering with his first sip the very existence of diabolo menthe’s concept, betrayed his concern about the matching possibilities of this beverage with the sticky rice’s more subtle notes. In front of me, the Berliner Argentinian was starting a dialog attempt with the Polish seated two chairs further. “You are confused and dishonest !”, hurled the latter with the anger of a man that might have been drunk but was still fit enough to charge very literally into him. Alas, I lacked courage and left them there to their burgeoning friendship, and I freely admit, thus also abandoned Constance to the doomed end of the table’s clutches ; and turning myself casually to the right, I focused on more gentle and civilised conversations. Things, in the end, cooled down. We ordered the bill, we said good bye. The last R.E.R. headed for Paris. Qu’est-ce qu’on allait foutre à Brétigny ? Le doute s’insinuait en moi sur le quai du R.E.R., alors que se préparait un voyage d’une demi-heure au départ du Châtelet. Dépaysées dès l’embarquement, nous entamâmes une discussion avec un travailleur en col blanc, habitué des complexités des transports publics, qui tenta bien de nous convaincre des avantages de la vie au grand air de la région parisienne. A Brétigny-Gare, des échanges enjoués avec des commerçants locaux nous indiquèrent la route à prendre jusqu’au centre d’art contemporain où nous attendait une présentation de performances, dans le cadre d’un événement “Noise & Capitalisme”. Le hasard avait fait qu’une connaissance berlinoise y avait été invitée, pour performer, et malgré son air très dubitatif quant à ce que pouvait bien signifier cette histoire de Noise & Capitalisme, j’avais décidé de ne pas rater ça, et d’embarquer avec moi Constance, ravie de “voyager enfin hors de Paris”, avait-elle dit d’un air enfantin en regardant défiler les arbres par la vitre sale du train. Le C.A.C (centre d’art contemporain) était posé au milieu de l’anonymat. Nous aurions pu être n’importe où en France (mais très certainement en France), devant le lycée cimenté, près de la salle polyvalente, en face du parking. Curieusement neuf, bien agencé, bien équipé, il nous attendait impatiemment, à en croire les regards intrigués et contents de la bande d’adultes mâles, tenues et coiffures branchées, squattant devant les portes vitrées. En face se tenait une bande plus réduite d’Emokids. Nous avions visiblement affaire d’un côté à l’équipe professionnelle artistique, de l’autre à son unique public, tout frais sortis du lycée d’en face. Notre arrivée ne manqua donc certainement pas de redonner un peu d’enthousiasme aux trentenaires fumant devant l’affichette, qui tentait d’appâter les ados d’un “Ce soir concert noise”. La première performance, celle du Berlinois de mes connaissances, présentait devant une salle quasiment vide les doutes de son performer quant à la validité même de sa présence ici parmi nous. Assis, les jambes croisées, il égrainait lentement d’un anglais international fortement mâtiné d’accent argentin extraits de Wikipedia et série de questions sur les pourquoi et les comment du noise, interrompant par moment la lecture de son papier pour jeter devant lui des regards sombres, interrogateurs ou intenses, c’était difficile à dire. Pour se venger de sa perplexité peut-être, ou faute d’une meilleure idée, il avait ensuite entrepris d’inviter l’organisateur du festival à commenter un choix de citations, qui, ne nous révélerait-il qu’à la fin, provenaient du prochain performer à venir sur la liste. L’artiste-organisateur se retrouva ainsi sans le savoir en train de dénigrer publiquement un de ses invités. Je me tournais, les doigts enfoncés dans les oreilles, pendant que le Berlinois à l’accent argentin, désormais debout, frappait un petit objet métallique avec une baguette, pour nous prouver qu’il pouvait être très noisy, lui aussi, s’il le voulait : la salle s’était entièrement vidée de son public hormis nous deux et l’équipe professionnelle, les Emokids ayant étrangement vidé les lieux sans que nous nous en soyons aperçues. Le suivant sur la liste, le musicien noise polonais, et un fidèle comparse déjà passablement alcoolisé, se mirent au travail. Très mal préparées à l’événement, il fallut évacuer rapidement la salle. Je m’y glissais bientôt à nouveau, deux bouloches de kleenex solidement enfoncées dans les oreilles. La sensation devait être la même plongée dans le réacteur d’un Boeing 747. L’expérience n’était pas complètement inintéressante. Je voyais plus clairement le lien avec le capitalisme. J’avais passé plusieurs années de travail salarié dans des cantines scolaires, et avais toujours bien voulu croire les études comparant le volume sonore qui y règne avec justement celui d’une piste d’atterrissage. Après une courte pause, nous nous préparâmes à affronter la troisième performance. Un homme jeune en chapeau, tournoyant entre les speakers, balançait du bruit tant qu’il pouvait à l’aide d’accessoires variés, mimant les rictus des rock-stars, crachant en l’air, se mettant à genoux… J’avoue, j’éprouvais quelques difficultés de concentration : du côté des portes vitrées largement ouvertes sur le parvis granité, de menus événements passionnants prenaient place. Une bande de joggeurs aux costumes intégralement fluorescents, les cinq visages tournés par la surprise vers l’épicentre sonore, traversa l’espace au ralenti. Une dame promenant son yorkshire entamait une discussion avec le bruitiste polonais. Elle exhortait visiblement son chien à écouter la performance. Ce dernier, cependant, renonça. Mais quelques minutes plus tard, au loin, un attroupement de femmes de plus de soixante ans approchait, leurs yorkshires les devançant du bout de leurs laisses (j’insiste, il s’agissait uniquement de yorkshires, même à cette distance je m’en rendais bien compte). Hélas, tout comme avec les Emokids, au coup d’œil suivant la scène s’était entièrement vidée de ses acteurs. Derrière moi, le fidèle compagnon du Polonais s’était assoupi dans un grand pouf blanc, une bouteille de porto à ses côtés, une cigarette roulée éteinte au bout des doigts. Adoptées par l’équipe professionnelle, la soirée se continua pour nous dans le restaurant asiatique de Brétigny. Nous étions clairement pour la patronne une aubaine inattendue, elle fit déplacer les tables. Tout cela n’était pas sans me rappeler la traditionnelle scène de l’auberge de tout bon film en costume. On commandait des pichets ; elle essayait, carnet à la main, de nous convaincre de prendre le menu à volonté. Les deux musiciens noise, complètement saoul pour le fidèle comparse, plus difficile à dire pour le maître noise, insultaient à couvert le personnel, renvoyant les pichets de rosé pour réclamer du rouge, le fond de bouteille de porto planqué à leurs pieds sous la table. Les artistes plus conceptuels s’inquiétaient quant à leur régime végétarien : devaient-ils prendre du riz gluant ? Le menu en français était confus… je dus choisir pour certains, d’autres produisirent un “passeport végétarien”. Celui-ci présentait avec des dessins simples ce qu’il était autorisé de consommer. La patronne parti d’un fou rire incontrôlable, et ignorant le marmotage agressif en polanglais alcoolisé des musiciens en bout de table, revint en demandant d’un air radieux : “Qui reprend des bières ?”. Je veillais au grain niveau menus végétariens, mais manquait probablement de vigilance quant aux boissons non-alcoolisées. Un exubérant diabolo menthe se substitua ainsi à la commande originale – une simple limonade. Le regard de l’Ecossais, qui découvrait avec cette première gorgée l’existence même du concept de diabolo menthe, trahit son inquiétude quant aux possibilités d’accorder ce breuvage avec les notes plus subtiles du riz gluant. En face de moi, l’Argentin berlinois entamait une tentative de dialogue avec le Polonais assis deux chaises plus loin. “Tu es confus et malhonnête !”, lui balança ce dernier avec la hargne d’un homme peut-être saoul mais encore assez en forme pour lui foncer très littéralement dans le bide. Hélas, je manquais de courage et les abandonnais là à leur amitié naissante, et je le reconnais volontiers, abandonnais par là même Constance aux griffes du carré maudit en bout de table ; et me tournant négligemment vers la droite, je me concentrais sur des conversations plus douces et plus civilisées. Les choses, finalement, s’apaisèrent. On commanda l’addition, on se dit au revoir. Le dernier R.E.R. rejoignit Paris. J’ai acheté pour l’avion le Monde Diplomatique, dans lequel une double page enquête sur l’obésité mondiale, un sujet mystérieux, auquel je réfléchis souvent. Arrivée à Lisbonne, dans le métro, face à moi une femme obèse se tient assise. Elle porte au poignet un bracelet en caoutchouc Coca-Cola. Quelques stations plus tard, une adolescente (ou était-ce une jeune femme ?) prend place sur l’autre banquette. Je remarque son très beau visage, comme sorti d’une bd de Pichard. Je pense aux corps rebondis de ces personnages de mon enfance, leurs seins, leurs culs, leurs bouches, qui me faisaient un peu peur. Au lieu d’interpréter son corps comme celui d’une presque obèse, ou disons : en surpoids, ne peut-on la voir plutôt comme l’une de ces créatures ? Je détaille ses vêtements, cherchant à y déceler les atours d’une séductrice. Un t-shirt orange, un caleçon plissant sur ses chevilles, et plus haut, posée sur ses genoux, une banane réfrigérante estampillée Danone. Arrivée à destination, tout à la ramification habituelle de mes pensées, je cherche la correspondance. Confrontée au choix entre la file d’attente pour l’escalator géant et d’interminables marches, la femme au bracelet Coca-Cola a préféré l’ascenseur, et elle nous double d’un air satisfait. Je croyais arriver à Lisbonne en terre européenne, en fruits, en légumes. Mais mes premiers regards sont pris entre les cuisses grasses, écrasées sur les bancs de bois d’adolescentes triturant des portables, des canettes gazeuses posées comme des accessoires à leurs côtés. A la fin, que voulais-je dire avec cette idée qu’ici aussi, “c’était l’Amérique” ? Sur le quai de la gare routière enfin atteinte, un couple de jeunes Allemands blonds, la graisse moulée en t-shirts kaki et shorts, piercings. – Obèses et piercings – “c’était l’Amérique”, au fond que cela voulait-il dire ? Perplexe face aux mouvements du monde, comme souvent, ou comme toujours, j’écrivais ceci en me disant que décidément, je devrais étudier un peu avant de voyager. Sur ce, j’embarquais avec bonheur pour quatre heures de route en direction du Sud, quatre heures à boire du regard les lieux, les gens, la lumière. Mais au moment du départ, une femme se précipite dans le bus, son enfant sur la hanche. La peau bronzée, son visage aux traits réguliers, ses yeux verts ou gris, d’une couleur intermédiaire, son corps pulpeux et ferme, elle s’enfonce dans un siège, son petit garçon emporté contre son ventre et ses cuisses. Sa robe à bretelles en soie turquoise épouse absolument chaque once de chair, là où elle est censée la recouvrir, laissant voir la ligne de ses bas, à mi-cuisse. Fascinée, je ne peux détourner mes yeux. Marilyn n’a qu’à bien se tenir, revoilà Pichard ! Son enfant, pouce en bouche, fouille dans son décolleté et y trouve la pointe de son sein. Elle caresse son front et enveloppe son petit corps du sien. Il me regarde d’un oeil avant de sombrer totalement dans son nirvana. A la dernière minute, je suis passée de l’Amérique en surpoids à l’enfance de Fellini. Derrière elle, un homme âgé mange des fruits de la passion. La femme à la robe de soie turquoise chante pendant le sommeil de son garçon, à voix basse, des chants gitans. Puis elle réveille son enfant et l’enveloppe de mille gestes, anticipant et forçant toutes les intentions. Elle décide tout. L’enfant semble parfaitement adapté à ses mouvements. Devant moi un autre enfant, en surpoids, joue avec son père. A l’entrée dans une ville, le bus ralenti, prépare son arrêt. La gitane libère ses cheveux châtains. There I go singing out loud on my bicycle chasing after the new Michel Houellebecq’s novel, coming out today in France, but here ?, so that tomorrow I can treat myself with a day of pure lecture, because 9/9, day of my birthday. The local main shop, Dussmann, informs me with a typical German courtesy, that it is not in their house that I will find what I am seeking for. Really really disappointed, I decide to go a little bit further, to the Galeries Lafayettes, where one can find in the labyrinthine lower ground floor slightly beyond the Poilâne bread and the macarons a space “Librairie Française”. The bookseller welcomes me straight on with a French Bonjour, and a conversation starts on the subject. The boxes sent by the publisher will not be there before the end of the week. I knew him a bit, Michel Houellebecq. Ah, I have been told he takes a shower only once a week. Some great writers were really dirty, I’ll say even stinking ; when I was working at the Opera Garnier’s library I could see pictures, the white collar Bam a bit of white chalk and there you go ; the hands filthy. We already read it, the novel, it is not so bad, [Is it funny ? I want/need it to be funny], we received our copy last week. Ah, couldn’t I buy it from you, your copy ? Ben, my colleague has it. Couldn’t I buy it from her tomorrow, the copy ? She went sick for a week. When you are writing you are sensitive to your own web of associations. Sometimes you hear this in somebody else, who moves you totally. “And the neck soaking in the fresh blue watercress”. “The fresh blue watercress”, this one was really good. Rimbaud, he’s worth particularly for his lightning sentences, you need just one and it turns a whole poem, from boredom we switch abruptly to the sublime. Take Les Ponts : “A white ray, falling from the height of the sky, wipes out this sham”. The poem got off to a bad start but he finished it off, and how ! I reckon Houellebecq’s success in Germany is because of his translator. He made him popular in the left radical circles, unlike France, by translating for example in Extension du Domaine de la Lutte that psychoanalysis made you antisocial ; while his character doesn’t say this, he says that psychoanalysis makes you unable to love. Yeah no but what’s more is that psychoanalysis socialise on the contrary. Psychoanalysis turned me into an antisocial. When I listen to some Bach’s Cantatas I burst into tears. I keep them for the cold weathers of course. Do you play music yourself ? So, shall we call my colleague ? She plays the bass. Salut Poulette, you’re in bed ? I’m here with a client, quite peculiar, but nice, who would want to buy you our Houellebecq’s copy because tomorrow’s her birthday, you’re through with it ? OK, I send her to you. She is ill, I will bring her some organic beetroot juice. Out on the Mehringdamm supermarket’s parking where my fellow bike rests, I see a very big absolutely pink bicycle that I know well. My friend came for lunch to my place today, and now she is shopping while I am heading flat out for the Schöneberg’s neighbourhood with beetroot juice in my saddlebags on the tracks of my novel. Her daughter’s backpack stayed in the front pannier. I slide a note in it : it’s Alice in Wunderland today, and more with her pink bicycle, a bicycle so quickly unmistakable like this makes you want to have it too. All this in a city eight times bigger than inner Paris. I am pedalling, heart as a lark, I am passing a very harmonious group of four young men with very long hair, curly, chestnut, similar beards, carrying instruments. Haupstrasse, twenty minutes of cycling later. Slightly sweating I ring at the door. It opens, she comes down with my novel. She holds out my present to me, saying “Happy birthday”. The 9/9, La Carte et le Territoire, will probably proved to be disappointing. But I celebrated it today, earlier instead than/of tomorrow. Me voilà partie chantant à tue-tête sur mon vélo à la poursuite du nouveau roman de Michel Houellebecq, sorti aujourd’hui en France, mais ici ?, afin de m’offrir demain une journée de pleine lecture, rapport au 9/9, date de mon anniversaire. La Fnac locale, Dussmann, m’informe avec une amabilité toute allemande, que ce ne sera pas chez eux que je trouverai ce que je cherche. Vraiment très, très déçue, je décide de me rendre un peu plus loin, aux Galeries Lafayettes, où se trouve dans le sous-sol labyrinthique un peu au delà du pain Poilâne et des macarons un espace librairie française. Le vendeur m’accueille direct d’un bonjour en français, et s’entame une conversation sur le thème. Les cartons envoyés par l’éditeur ne seront pas là avant la fin de la semaine. Je l’ai connu un peu, Michel Houellebecq. Ah, il paraît qu’il ne prend de douche qu’une fois par semaine. Certains grand auteurs étaient vraiment sales, voir ils puaient ; quand je travaillais à la bibliothèque de l’Opéra Garnier je voyais des photos, le col blanc vlan y t’y collaient un coup de craie dessus et c’était parti ; les mains dégueulasses. On l’a lu, nous, le roman, il est pas mal, [Est ce qu’il est drôle ? J’ai envie/besoin qu’il soit drôle], on a reçu notre exemplaire la semaine dernière. Ah, je pourrais pas vous l’acheter, votre exemplaire à vous ? Ben, c’est ma collègue qui l’a. Je pourrais pas lui acheter demain, à elle ? Elle est en arrêt maladie pour une semaine. Quand on écrit on est sensibles à notre propre réseau associatif. Parfois on entend ça chez quelqu’un d’autre, qui nous bouleverse. “Et la nuque baignant dans le frais cresson bleu”. “Le frais cresson bleu”, ça c’était bien, ça. Rimbaud, y vaut notamment pour ses phrases fulgurantes, il suffit d’une et sa renverse tout un poème, de l’ennui on passe brusquement au sublime. Voyez Les Ponts : “Un rayon blanc, tombant du haut du ciel, anéanti cette comédie”. Le poème était mal parti, et finalement il est bouclé, et comment ! Le succès de Houellebecq en Allemagne, moi je pense que c’est à cause de son traducteur. Il l’a rendu populaire dans les milieux radicaux de gauche, contrairement à la France, en traduisant par exemple dans Extension du Domaine de la Lutte que la psychanalyse rendait asocial ; alors que son personnage ne dit pas ça, il dit que la psychanalyse rend incapable d’aimer. Oui non mais en plus la psychanalyse socialise au contraire. La psychanalyse m’a rendu asociale. Quand j’écoute certaines Cantates de Bach je fond en larmes. Je les garde pour les temps froids bien sûr. Vous faites de la musique ? Alors, on appelle ma collègue ? Elle joue de la basse. Salut Poulette, t’es au lit ? J’ai ici une cliente, assez particulière, mais sympa, qui voudrait te racheter l’exemplaire du dernier Houellebecq parce que demain c’est son anniversaire, tu l’as fini ? OK, je te l’envoie. Elle est malade, je vais lui apporter du jus de betterave bio. En sortant, sur le parking du supermarché de Mehringdamm où est garé mon ami vélo, je vois une très grosse bicyclette résolument rose, que je connais bien. Mon amie est venue manger chez moi ce midi, et là elle fait ses courses pendant que je m’apprête à rejoindre le quartier de Schöneberg à toutes berzingues avec du jus de betteraves dans mes sacoches à la poursuite de mon roman. Le sac à dos de sa petite fille est resté dans le panier à l’avant. Je glisse un mot dedans : c’est Alice in Wunderland aujourd’hui, en plus avec son vélo rose, un vélo reconnaissable aussi vite comme ça qu’on aimerait avoir le même. Tout ça dans une ville huit fois grande comme Paris intra muros. Je pédale, le cœur comme un pinson, je croise un groupe très harmonieux de quatre jeunes hommes aux cheveux très longs, bouclés, châtains, aux barbes pareilles, portant des instruments. Hauptstrasse, vingt minutes de vélo plus tard. Un peu transpirante je sonne à la porte. Elle s’ouvre, elle descend avec mon roman. Elle me tend mon présent et me dit “Bon anniversaire”. Le 9/9, La Carte et le Territoire, s’avéreront sûrement décevants. Mais je l’ai fêté aujourd’hui, plus tôt que demain.